"Honey, did we remember to pack Alex?!?" As I sat on the steps of Mt. Rushmore National Park, I realized that I was looking at a masterpiece. The precision. The scale. The scope and the grandeur. I am, of course, referring to the comic trade paperback I was reading: Crisis on Infinite Earths. Oh yeah, that big rock presidential head thing was cool, too. My wife, Teri, had convinced me to load the family into the mini-van and take a REALLY LONG drive to South Dakota. We did it all: Rushmore. Crazy Horse. Deadwood. Badlands. I even found the answer to the age-old question about where the heck you-know-what was. In addition to a bag of single issues, I selected Watchmen and Crisis. Both rank in my Top Ten of favorites. Both were twelve issues long. Both were published around the same time more than 15 years ago. Watchmen redefined super-hero comics into the ironically termed "realistic" grim and gritty era. From that point on, super-heroes needed to be certifiable with tons of baggage and issues and insecurities. Crisis, however, redefined the DC Universe. For those of you who don't know (or care), some comic characters share the same universe. They do this to make appearances in each other's books to raise sales, but also to convey a "bigger" sense of story. Stan Lee's Marvel Comics all inhabited the same place so Spidey could swing by Thor or Daredevil or visit the Fantastic Four. The DC Universe worked the same with Batman, Superman and company. Prior to 1985, comics took themselves a lot less seriously. Every time a writer came up with an idea regardless of how much it altered the character or previous stories, the story was published. If you want Superman teaming up with Jonah Hex in the Wild West, do it. If you want a planet where the JLA was evil and Lex Luthor was the lone super-hero, fine. If you want Robin to grow up and Batman to retire and marry Catwoman; that's cool, too. As the average age of comic book readers rose, fans paid more attention to continuity. They wanted explanations and hated contradictions. DC's solution at the time was to create alternate earths for these stories. Earth One had the Justice League. Earth Two had the Justice Society. Earth Three had the Crime Syndicate. Eventually, the earths were double digit numbers and most letters. By the mid-80s, it was impossible to explain DC's continuity without charts, graphs and a lot of time. The solution? Hit the Big Cosmic Reset Button and start over. That's Crisis on Infinite Earths. A comic series that actually lived up to it's hype by truly changing the status quo. Heroes died and were replaced. Entire earths were destroyed. Continuity was literally rewritten .Some stories simply never "happened." Crisis gave new readers what they needed, a starting point. It's seventeen years later and I think this story still holds up. Of course, there were continuity "problems" from the moment Crisis ended, but that's what happens when you publish serialized material continuously for 60 plus years. On a personal level, I was very entertained while re-reading it. That's not always true. That "totally rad" episode of Thundercats from your youth seems less so now. That "awesome" series of novels you read in 7th grade seems boring and formulaic. Crisis wasn't like that. To me, it was a huge story with literally hundreds of characters and it still was pretty "rad." 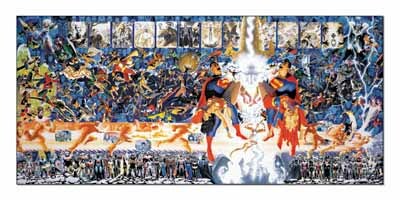 Crisis on Infinite Earths was written by Marv Wolfman and drawn by George Perez. It's available in softcover and goes very well with national monuments and long car rides.